Sorry AOC, but your grift is over. A “regular girl from the Bronx” couldn’t afford a museum-quality pearl so large and valuable, idiot! Remember when Olying’o-Cortez claimed she couldn’t afford to rent an apartment in D.C.? If that’s true, why is she living large, wearing a turban made of luxurious yellow-and-blue silks? 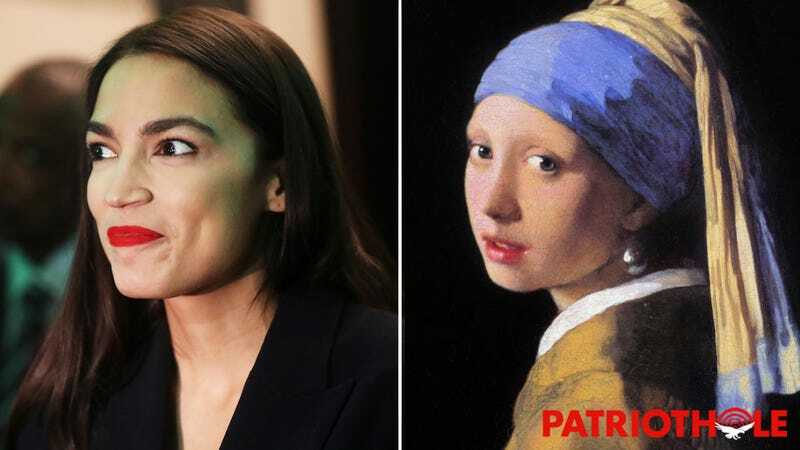 AOC wants the public to view her as an ordinary person, but her amazing pearl earring and incredible outfit prove she’s part of the wealthy 1% that she whines about so incessantly. Huh, gee, it looks like capitalism isn’t so bad when it comes to buying priceless pearl jewelry you can flaunt in paintings. AOC’s entire backstory appears full of holes when you glance at this painting. Olazy’o-Snoretez claims to have worked as a bartender to make ends meet. But if she really had a demanding server job like that, then why is the expression on her luminous face so enigmatic—half-smiling, half-beguiling—instead of looking exhausted after working a double shift? Checkmate, AOCidiots. Maybe we should change AOC’s initials to AOP (Alexandria Owning-Pearl) because that’s a more honest description of this liberal huckster. Little Miss Green New Dunce says she supports socialism, but this shocking image proves that she’s willing to spend her private millions commissioning beautiful portraits of herself wearing imported fabrics and luxurious pearl earrings. Sorry, liberals, but it looks like the only elected office AOC will be running for any time soon is Queen Of The Hypocrites. Time send her packing!